Have you ever done a runner from the dentist? Are you petrified of clowns? Have giant headlice tried to eat you? Have you ever been attacked by Library Ninjas when your book was five years overdue? And have you come up with a genius way to never do homework again? All of these th... read full description below. Have you ever done a runner from the dentist? Are you petrified of clowns? Have giant headlice tried to eat you? Have you ever been attacked by Library Ninjas when your book was five years overdue? And have you come up with a genius way to never do homework again? All of these things have happened to me. 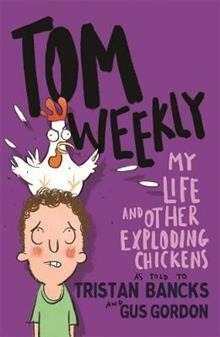 I'm Tom Weekly. My life is an exploding chicken and the book in your hands is my attempt to glue it back together again. Tristan Bancks (Author) Tristan Bancks tells stories for the page and screen. His books for kids and teens include Two Wolves, The Fall, Detention and the Tom Weekly series. Two Wolves won Honour Book in the 2015 Children's Book Council of Australia Awards and was shortlisted for the Prime Minister's Literary Awards. The Fall was a CBCA Notable Book and shortlisted for the Adelaide Festival Awards for Literature. Tristan's books have also been recognised in multiple children's choice awards. Tristan is a writer-ambassador for literacy charity Room to Read. He is currently working with producers to develop several of his books for the screen. He's excited by the future of storytelling and inspiring others to create. You can find out more about Tristan's books, play games, watch videos, chat to the author and help him try to change the world at www.tristanbancks.com. Gus Gordon (Illustrator) Gus Gordon is an internationally acclaimed illustrator and author. He has illustrated and written over 80 books for children. His illustrations are known for their loose and energetic line work, mixed media and humour. His writing is always anthropomorphic. He attributes this to his love of Kenneth Grahame's Wind in The Willows. Gus's first picture book, Wendy, was a Notable Book in the 2010 Children's Book Council of Australia (CBCA) Picture Book of the Year Awards. His second picture book, Herman and Rosie, now published in twelve countries, has been internationally acclaimed and awarded. Somewhere Else was published by Penguin Random House Australia in 2016.